Research - Emily L. Coderre, Ph.D. Language is one of the greatest abilities the human race has ever developed. Yet language is vastly complicated, consisting of complex interacting processes like acoustic recognition of speech, visual word recognition, and production of fluent and meaningful speech. How does the human brain perform such complicated processes, and how do such complex processes shape brain function and organization? How do life experiences such as bilingualism, or developmental disorders such as autism, affect how language is processed by the brain? And can we use our understanding of language in the brain to design clinical interventions that specifically target the underlying neurobiology? These questions form the backbone of my research. I have been a lover of language(s) and an avid reader since I was a child. In what was once a separate vein, I have also always been fascinated by the human brain, even before majoring in Psychology as an undergraduate. When I realized that I could make a career out of studying the two in tandem -- language in the brain -- I was sold. I was first exposed to this line of research as an undergraduate at the University of Vermont, where for my senior honors thesis I ran an fMRI study investigating how executive control of language in a Stroop task differed among the two scripts of Japanese, kanji and kana. I pursued this interest in language and executive control during my graduate degree at the University of Nottingham, where my research focused on two main themes. ​The first main theme of my graduate work was an exploration of the Stroop task, an executive control task which allows for a unique exploration of the interaction of language and executive control. Using electrophysiological and neuroimaging measures, I used a specific variation of the Stroop task that varied stimulus onset asynchrony (SOA) to explore how modulations in the requirements for executive control affected conflict-related ERP components and the recruitment of the executive control network in the brain. The second main theme of my graduate work was in the bilingual advantage: the phenomenon that bilinguals often out-perform their monolingual counterparts on executive control tasks, which is thought to stem from the need to employ executive control during language processing in bilinguals. 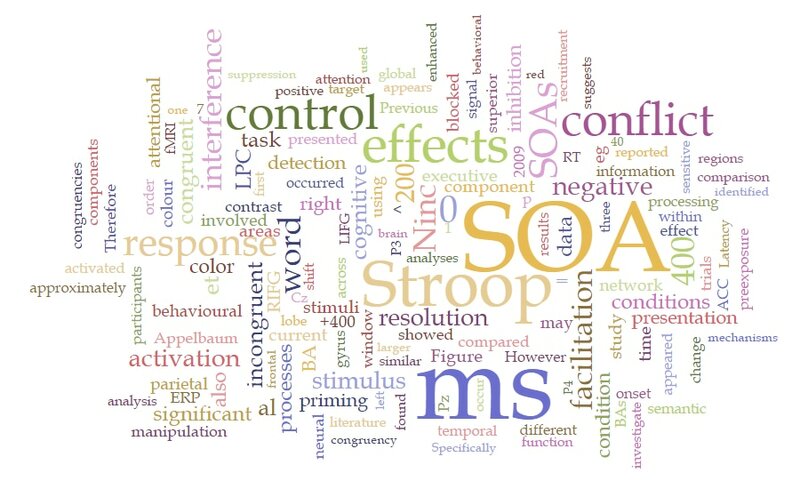 Using the same SOA modulation of the Stroop task, I demonstrated using EEG that bilingual executive control mechanisms differ from monolinguals even before the onset of conflict, suggesting a more proactive than reactive executive control system. 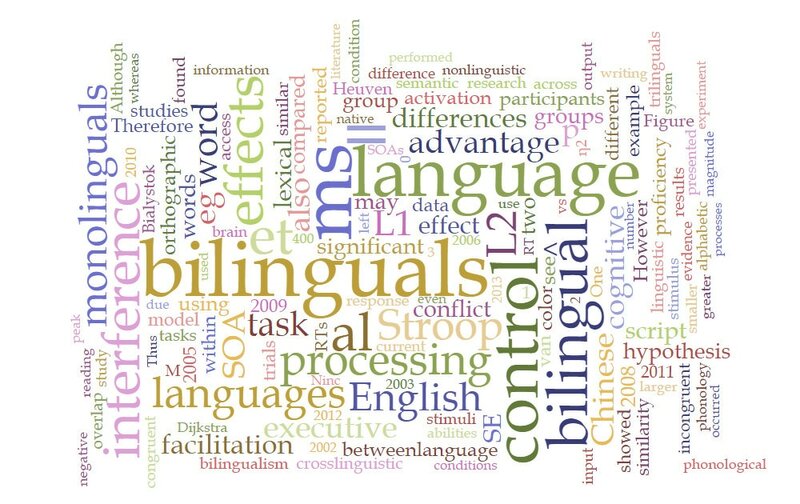 Using fMRI, I also demonstrated that the functional overlap of the language and executive control systems in bilinguals differs from that of monolinguals, suggesting that the bilingual experience affects the organization of these two networks in the brain. For my postdoc in the Division of Cognitive Neurology/Neuropsychology at Johns Hopkins University, I shifted from studying superior language abilities in bilingualism to language deficits in individuals with autism. In this lab I explored the use of EEG as an implicit measure of receptive vocabulary knowledge, which is of particular importance for individuals with severe autism who often have little-to-no functional speech. I also developed a line of independent work using EEG to identify why semantic processing deficits are often localized to linguistic stimuli but are spared in non-linguistic stimuli like pictures or auditory sounds. 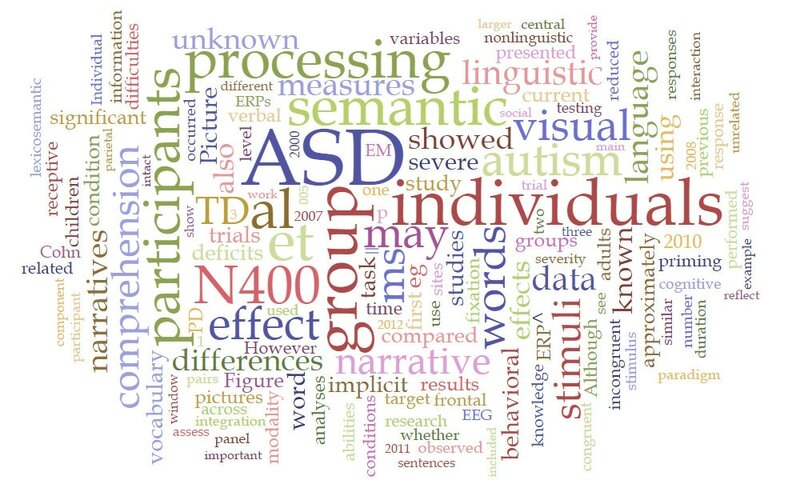 I have investigated this in single words as well as more complex narratives, and am also exploring the use of EEG coherence analysis to identify the underlying neural connectivity that may give rise to these language-specific deficits. Through a fellowship with the Science of Learning Institute at Johns Hopkins, I also developed a line of translational research with applications to literacy and language interventions in autism. In collaboration with colleagues in the School of Education at Johns Hopkins, I paired an empirically-based literacy intervention with non-invasive brain stimulation to improve reading comprehension in individuals with autism. In August 2017 I joined faculty as an Assistant Professor in the Department of Communication Sciences and Disorders at the University of Vermont, where I am continuing my current lines of research investigating semantic processing, language, and reading comprehension in individuals with autism using EEG, eye-tracking, and fMRI. For a complete list of my publications, please visit the Publications page.